Please note these help pages are formatted best for a large screen. Help for using the current release of the app. Then Tap on this button to return to the app main menu. The Dotted List Control (upper left) takes you back to the Vinotar® Selection screen and the Line List Control (upper right) takes you to the Main Menu. 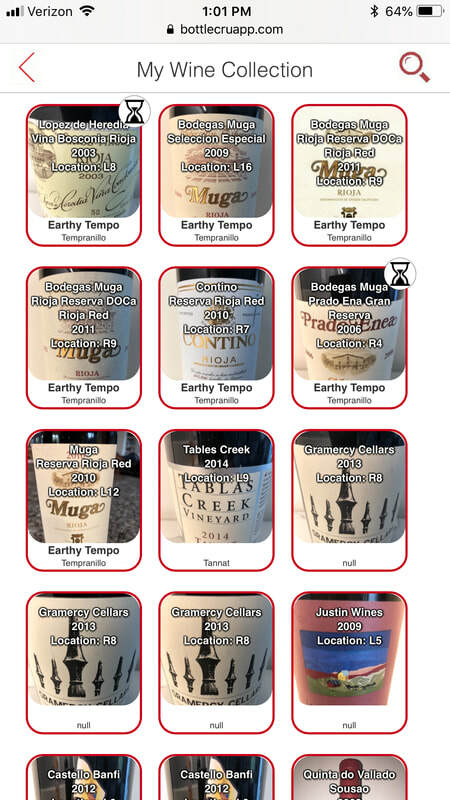 Find wines styles by menu lists, text input, voice input of a specific varietal, blend or appellation/region. 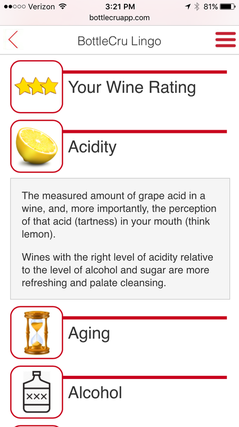 Knowing these styles is the key to finding the wine you will love and successfully pairing food and wines! These other wines are also likely stand-ins for food pairing substitutions for wine-lovers seeking even more variety in the wines they consume. If your even unsure of the wine's Type or Style or it's a unique blend...just Tap on "Red Blend" or "White Blend" and edit it later..no problem! 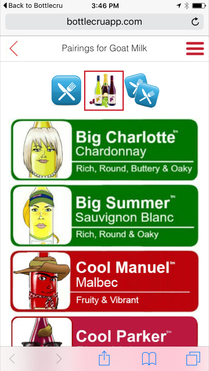 For BC Curated Wines just input your comments and star ratings, everything else is already filled-in. For other wines, Tap Capture Bottle and Take Photo to take a picture of the label with your phone camera or Tap Photo Library to select one from your smart-phone camera role and then fill-in the other wine information. 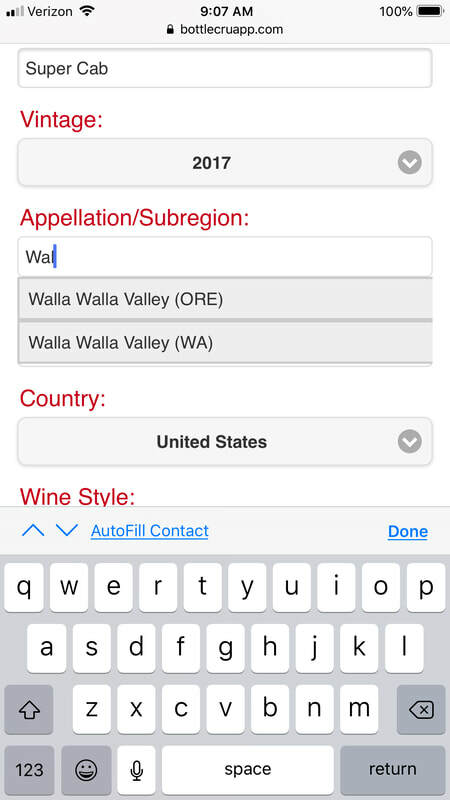 Start putting-in an Appellation and the app will auto-fill its region and country or you can over write it. You can also search the web for information about any wine in a tasting and get reviews, pricing information and purchasing sources, Tap on "Search Web For This Wine"
You can also add a new entry into your wine inventory for a duplicate of this wine, just tap "Duplicate into inventory" and then select it and modify any field you want (vintage/storage location) and save and then tap "Update". Tap on the Facebook or Twitter buttons to share your reviews on your Facebook page or Twitter account. 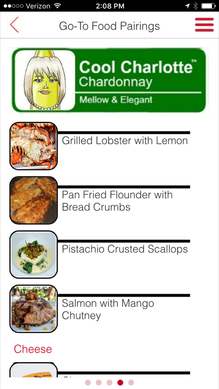 Lastly you can down-load a spreadsheet of your Tasting Journal by Tapping the spreadsheet Icon. 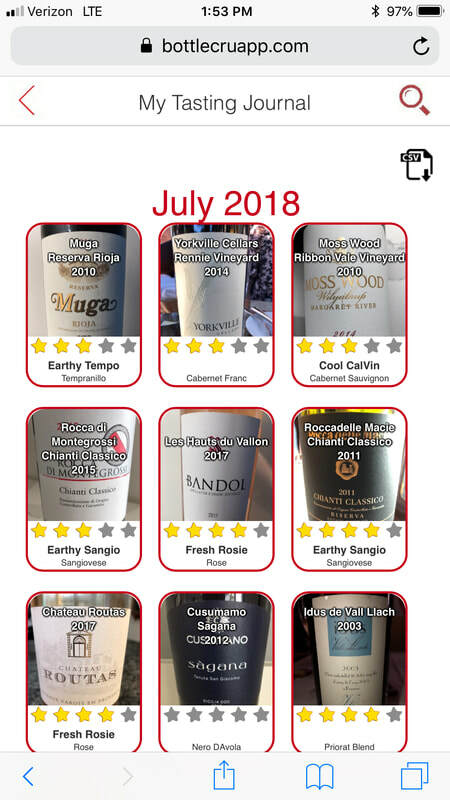 Tap on My BottleCru™ and Wines Style Scorecard™ to see the average star ratings of your tasting reviews of each wine style. 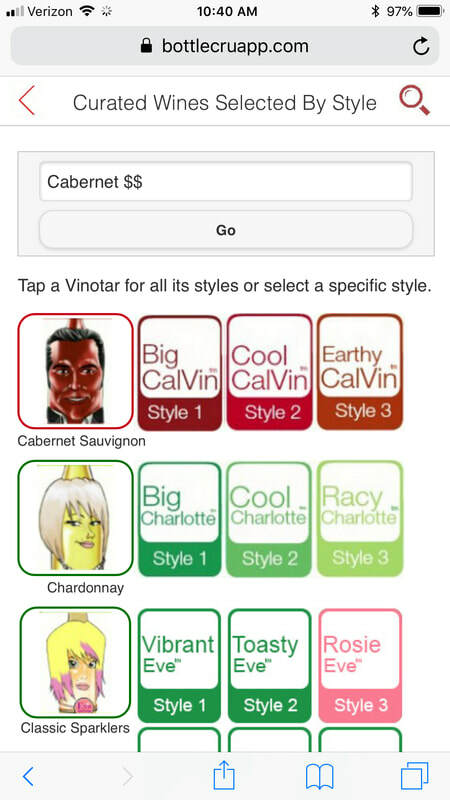 By Tapping on the search icon, you can search by Producer Name, Appellation, Vintage or Price range ($$). Just separate the search terms with spaces. Tap on the wine you want to see a list of web-sites which will help you order that wine. 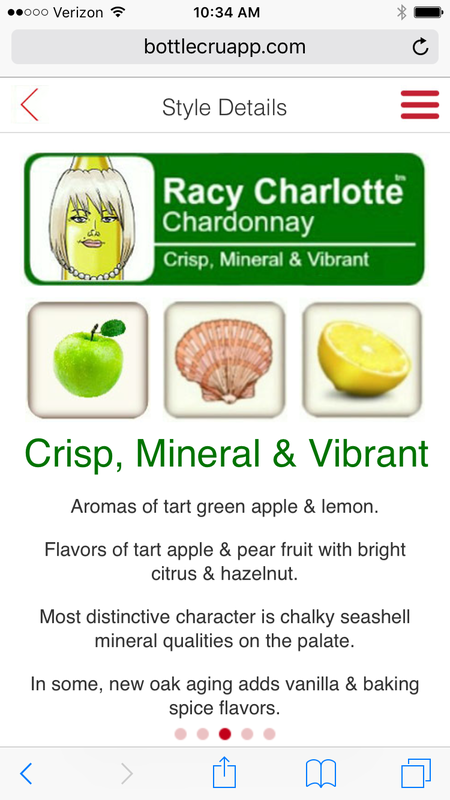 If you can't find the wine you want to order from our curated list of wines, use the style WordClouds to communicate to a server or sales person, what style of wine you want. Also refer to the wine type's source regions listed on the style pages, as a check you are getting the style you're seeking (it's not exact but a great guide). Only a knowledgeable wine professional who has tasted a specific wine release or its inclusion in the BottleCru Selected Wines listing will guarantee its style. Tap on "Style details & similar wines"
Tap on "Search your wine collection"
Tap on "Review your tasting history"
Tap on "Search BC curated wines"
Tap on the second blue Knife & fork "icon"
On the Add To Collection screen Tap on Capture Bottle to take the label image and use your phone's Camera app to capture it or select it from the Camera Roll, if you took an image previously. You can even add a label image from the web captured on your Camera Roll, but it may need to be rotated 90 degrees using the Camera App first based on your camera settings. If it wasn't a BC Curated Wine, Input all relevant information about a wine you'll like to record and later us as a search term; Producer, Release Name, Vintage, Appellation, Country, Wine Style (if you know it), price, Alcohol by Volume (ABV), and storage location and other notes you like to record. Start putting in Appellation and the app will auto-fill its region and country or you can over write it. When the app shows Added To Collection, if you want to store other bottles of a different wine, Tap on Add Another Wine. If you want to add more bottles of the same wine, Tap on"Duplicate This Wine" button and then make any changes you want for this next wine, such as storage location and then Tap on "Save Update" button. Repeat until you've added all your wines. If your done adding wine Tap on View My Collection. Your collection will be displayed, showing the label images with other key data overlay-ed. Wine are listed showing the most recent entry first. You can search the web for information about any wine in your inventory and get reviews, pricing information and purchasing sources, even label images (may need 90 degree rotation). Tap on "Search Web For This Wine". To make another identical collection copy, Tap "Duplicate Into Collection". Edit nay changes, e.g. storage location and then tap "Save Update"
It also possible to Load an Existing Wine Collection you have in another computer application into the BottleCru app. All you need to create a CSV formatted Excel spreadsheet or equivalent in the format of the attached file. Send that file to support@bottlecru.com with your contact information. We will insure it's in the correct format/data syntax import it for you. We'll let you know when it's in the app. Images are not yet insert-able but can be added by you later.